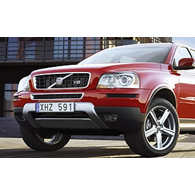 (autoinsidernews) - Volvo today announced retail pricing of its new XC90 Sport, which debuted at the British Motor Show in July. The XC90 Sport will have a starting base price of $49,300, which is $2,875 more than a standard XC90 V8 AWD. So what do you get for those extra dollars, special red or silver paint, matte-finish trim and detailing, 19 inch wheels, double chromed exhaust pipes, a higher quality, sportier interior including sport seats, and a sport-tuned suspension, which includes dynamic sport chassis, stiffer anti-roll bars, firmer shock absorbers, a sport-tuned, speed-dependent steering system, reports Trend. The limited production 2007 XC90 V8 Sport will be available at Volvo dealers before the end of the year.